My focus in life has in more recent years been to vibrate higher with a Purpose to Serve and not just a Life to Live. As I learn more and more about who I am and the world in which we live, I now believe that a purpose to serve and lifestyle to live must go hand in hand. It should compliment each other. It is important to serve while also important to live. As a Licensed Clinical Social Worker I have studied mindfulness and include this in my therapy approaches. The social work profession upholds the ethical responsibility to consistenly evaluate and research the most up to date evidenced-based interventions. More recently, I have recognized that traditional work as a social worker has changed over the last twenty years. As a 21st century social worker I now utilize an array of modalities to help people make significant shifts in their lives, but have adapted more of a holistic approach within my outpatient practice. I now incorporate Mindfulness into treatment sessions. I educate clients on the components of Mindful Living. Historically, any type of distress or disease has been considered to be the result of an imbalance between the dynamics of mind, body, and soul. I have begun to access a range of tools to help not only people, but myself to discover the core essential self, which I believe holds the key to healing. These tools, which include yoga, mediation, guided visualization, and Mindfulness. In researching Mindfulness further I learned and recognize models developed by John Kabat-Zinn, PH.D, Zindel Segal, John Teasdale, and Mark Williams. So one of the initial reasons why I practice mindfulness is because I practice what I preach. As someone looked to for guidance and healing in a therapeutic setting I believe it is important that what I prescribe clients I should either believe in and/or have done it myself and found it to be beneficial and produce outcomes. I see clients often in distress and despair. Many have difficulty managing stress caused by overwhelming emotions and situations. Most often it is because their coping skills have failed them and they are in need of learning new ones. People are beginning to no longer trust western medicine and be more open to holisitic, self-healing practices. Based on the client, I can determine if prescribing the practice of mindfulness to include meditation would be helpful or not. The key to mindfulness is being able to become an observer and practicing non-judgmental awareness of the present moment. This alone can help one distract from problems that we all too often place our every moment focus on. Being an observer means paying attention. I now do just that. As I walk my dog, as I stroller stride with my children, as I walk to the mailbox, as I drive my car, as I eat my food I am aware of that moment. I observe my surroundings rather than be on autopilot thinking about what my day will include next. I find myself slowing down and experiencing everything I do. I enjoy things more and find myself having less stress, anxiety, and more personal truths. Chopra Deepak described it best when he shared how the mindfuless person will walk to the mailbox everyday and get the mail and scurry back inside while the mindfulness person will walk to the mailbox everyday observing the flowers growing in the courtyard, the clouds moving across the sky, the wind touching their cheek, etc. Chopra Deepak prescribes you to Choose one mundane activity that you do every day, such as brushing your teeth, making the bed, or washing the dishes. Instead of rushing, put your complete attention on this task. If your mind is impatient or prods you to move on to more “important” business, ignore it. Don’t judge yourself; simply return your attention to what’s in front of you right now. This simple daily practice of focusing your awareness on one activity can create a powerful ripple effect that will expand your experience of present moment awareness throughout the day. Without recreating the wheel here is a great guide to Mindful Living 101 that was created by Jen Moff, life coach and transformational speaker. Here is a picture of a web I noticed in the grass while walking my dog. It was early in the morning where morning dew was still present. This is clearly morning dew allowing the web to show through. The following photos are just flowers blooming after rainfall that I noticed on an evening stroll. Had I been rushing or on autopilot I wouldnt of noticed these beauties. 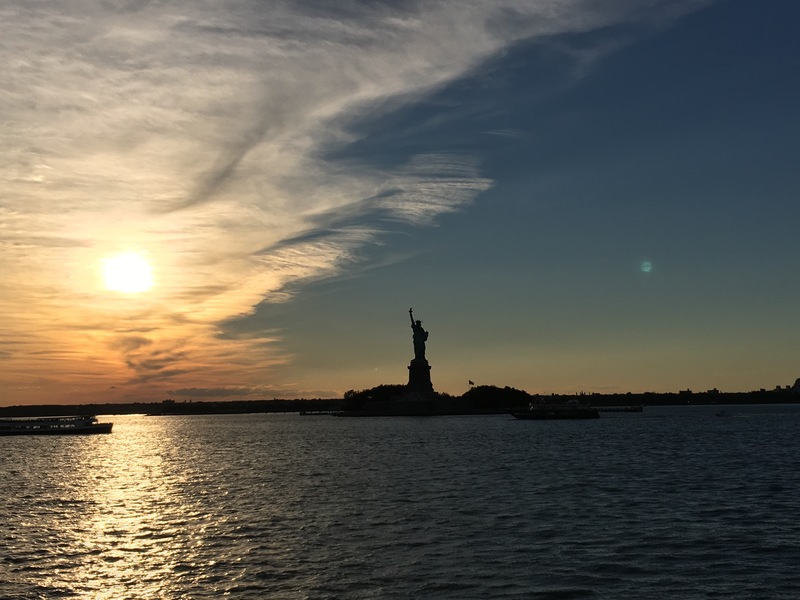 Here’s an awesome photo taken by mother while she rode the ferry in New York at Sunset. Ask yourself, how often do you watch the sunset? How often are you aware of your present moments?